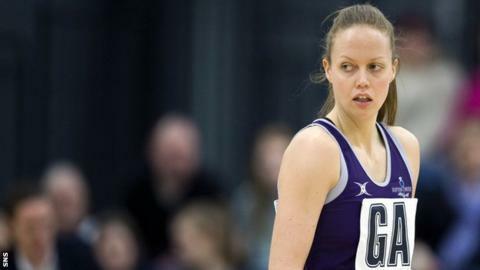 Scottish Netball has announced that Scottish Thistles captain Lesley MacDonald is retiring after earning 127 caps. MacDonald, 34, was first capped in 1999, but played her final matches in the Commonwealth Games in Glasgow. "The Commonwealth Games was massive for me," said MacDonald, who will now take up a coaching role. "It's the pinnacle event for any netballer and I was hugely honoured to have captained the team"
Scotland finished fifth in their Pool A group at the Glasgow 2014 Commonwealth Games, finishing in ninth place after a 46-28 win against Trinidad and Tobago. MacDonald insists that her retirement from the international game will not be the end of her career in the sport as she looks towards Scotland competing in the 2015 World Cup. "I will always be a Scottish Thistle through and through and look forward to watching and supporting the Thistles on their journey to the World Cup next year and beyond," said MacDonald. Scotland coach Gail Parata said: "Lesley's contributions to international netball have been outstanding over the past 16 years. "To be amongst the elite netballers in the world who have achieved more than 100 caps is exceptional. She will be missed."